This is what I would have done if you had driven west on US12 to my frame shop in Niles Mi. As a professional I have to take a professional approach to any repair or my reputation and therefore my income takes a hit when it isn’t completely right. I would start by aligning the front triangle on my cast iron table. 1st the bottom bracket shell needs to be tapped and faced. Trek frames had a pretty casual relationship with accurate alignment. Then the dropouts have to be checked and corrected to make sure that they are not only 130.5 spacing but also equidistant from the centerline of the frame. I have much better tools for checking that then the silly string method that will likely only get it close. Once spread the dropouts need to be made parallel again with H tools and the hanger bent to be in the same plane as a true wheel. While it is possible to reuse the present brake bridge I would definitely replace it for several reasons. 1st the other side is probably not all that well attached either. 2nd it is hard to clean the inside enough to get a good internal fillet – especially if using silver (I would have used brass if doing it the way you did). 3rd it puts less stress on a frame to lengthen the bridge to the new width between the seat stays. And 4th I would place the bridge at the position that gives me the clearance I want with the brakes I want to use (and I would chose a 47/57 brake and not the shorter 39/49 on this kind of frame for possible wider tires and fender clearance). Of course a brake bridge needs to be mitered. If I am going to use silver brazing material I would machine miter it, if hand mitering, I would use brass. While it is possible to use 56% silver for brazing the brake bridge I prefer using stronger 48%. Of course after brazing the alignment has to be checked and corrected again. It can and will move when heat is applied. After brazing I would patch the area with primer and then look through the hundreds of old Imron paint cans to find the closest color and blend it in. Since it isn’t a show bike the over spray would not be that noticeable. Lots of sanding would still be involved. Since you must not know who I am or you probably would have called for an estimate, I’ll introduce myself. I was one of those original Americans to trek to Europe in the 70’s to learn from a master over there (like my colleague and fellow Michigander Matt Assenmacher did a couple of years before me). I got my teaching education degrees at Andrews University in Berrien Springs, MI and taught high school for a few years before going into frame building and painting full time. I’ve taught frame building classes regularly since 1976 to hundreds of students. I don’t go out of my way to market myself but I hang out a lot on framebuilding sites. Those that really want to learn how to build frames that do the most research on schools find me. I wish I would have known! I went past Niles last October to ride the Apple Cider Century in Three Oaks. I will definitely reach out to you for future issues or projects. Perhaps we will meet someday at a ride or event in Michigan. I am a fellow educator by the way. Do you have a website or phone number you can post? If such isn't allowed please message me with the information if you don't mind. As a total aside- I don't think that's a 1985 Trek 620. It looks like you did a wonderful job with the repair. I have the year wrong. It is a 1984 620. Last edited by bnewberry; 03-16-19 at 07:47 AM. I might have the year wrong. It is a 620. "Irregardlessly," any year of 620 is cool- and it says something that you put the effort and energy into learning and repairing it. Thanks! I am hopeful this will be a good ride. My current favorite frame is a 640 which is an "oddball" frame in the Trek line. It has a longer than normal wheel base compared to most. I am thinking that the longer wheel base of the 620 will be perfect for long summer rides. I've got an 85 620- it is a wonderful bike loaded or even unloaded. It's sturdy (although your experience may beg to differ), stable and light enough to be comfortable for long rides. Perhaps the brazing specification for this bridge at the factory was more minimal than for frames that carried a caliper on the bridge? Wouldn't the bikes with caliper brakes have a reinforcement at each end of the bridge? Doug is right about frame alignment on some 1984 Treks like mine, I had to re-align the entire frame when my leftover 720 was new! Impressive repair and informative thread. Mr. Fattic’s assessment of Trek’s casual approach to alignment would appear spot on. My ‘79 710 is not aligned perfectly (but still is a pleasure to ride). I doubt it was a specification issue, I am sure it was just a poorly done braze job. Chances are it would have held up just fine without the extra stress I put on it by forcing the wider hub and the subzero weather we had this winter. Hopefully the rest of the rear triangle was done better. 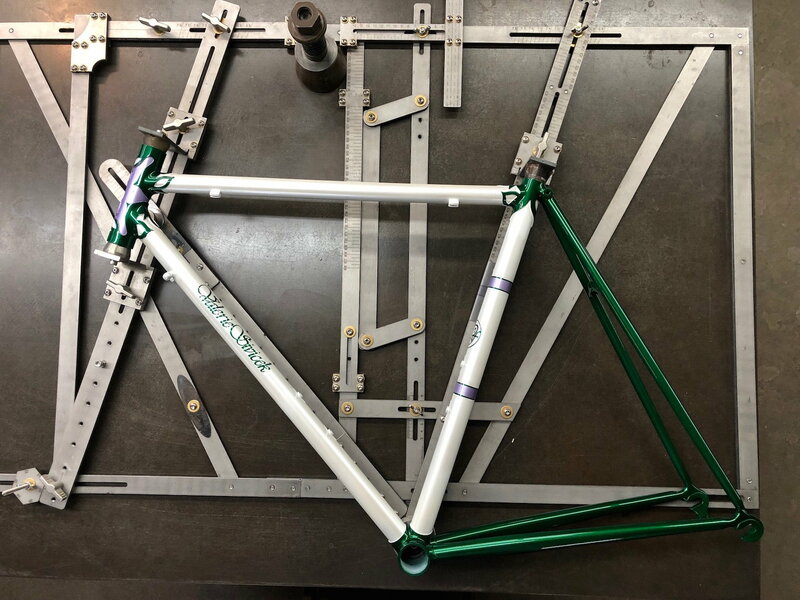 The 600 series in this year's production had the rear triangle brazed in Asia and got joined to the main triangle in Wisconsin. As for alignment, I have no doubt that a production bike will not get the care in alignment that a custom bike gets. If it rolls straight enough it is good enough. The defective frames we are talking about did not roll down the road straight at all! I straightened mine over a pair of park benches, while jumping up and down on the bike-turned-trampoline. I luckily arrived at a straight-riding bike in short order, and which spared me the hassle of getting the budget-priced leftover 720 warranted by Trek. I still have the bike, it now has 700c Mod4 rims on re-spaced, solid-hi-flange Specialized Tandem hubs. It has endured much commuting mileage and a few collisions with cars in L.A. and still rides nice and straight. The metals we are talking about are not all that sensitive to atmospheric temperatures so yes, the brazing was just plain deficient in one way or the other. I wish I would have known! I went past Niles last October to ride the Apple Cider Century in Three Oaks. I will definitely reach out to you for future issues or projects. Perhaps we will meet someday at a ride or event in Michigan. I am a fellow educator by the way. Do you have a website or phone number you can post? If such isn't allowed please message me with the information if you don't mind. I suspected you didn’t know who I was. I got a call last week from a classic bicycle enthusiast that lives in Berrien Springs (the town right next door where I live and I frequently cycle right by his house) who recently found out I was not only a long time builder but also taught classes. I don’t go out of my way to promote myself and don’t have a website. I get just the right amount of work to not be rushed and take care of all my students and occasional customer. You can email me using my first and last name in one word all in lower case without any dots or spaces and end with qtm.net after the AT. Most of my time is spent teaching 3 week long framebuilding classes. I do some shorter brazing classes too. Teaching others how to build frames was the reason I went to learn in England. And I often end up painting those frames with student help. in Ukraine where I do a charity bicycle project. When you want to take the next step in playing with fire making frames I’m not that far away to show you how it is done. If you are curious I can send you lots of information by email. By the way, I’ve done the Apple Cider Century ride in Three Oaks almost every year since 1976. There is one of my road bicycles in the bicycle museum near the start. I made it to be light in 1979 and it weighs less than 16 lbs. At the time it was placed in the museum it was supposed to represent a “modern” bicycle but of course it is 40 years old now. That frame is simply stunning! I would love to build a frame, it is now at the top of my list of things to do. It will probably have to wait until I retire (the second time) which will be in 2022 or 2023 unless I can manage the vacation time in a way that will work. I will contact you for details.